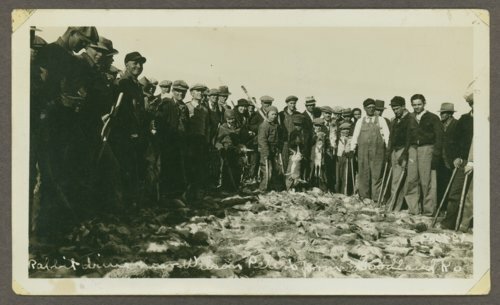 This is a photograph showing a rabbit drive on Wilson Peter's farm near Goodland, Kansas. During the 1930s, Kansas suffered a major drought. As a result, jack rabbits ate what little vegetation was growing. To reduce the rabbit population, they were rounded up in a pen and killed.